The upcoming elections are creating a lot of hype not only on ground but also on social media. We are hopeful that a smooth electoral process would take place for the third time in Pakistan. The excitement is visible from drawing room discussions to television talk shows, and social media posts; however along with this ‘trolls’ have can be seen in action! Social media teams of all political parties are in a race to promote their successes and spreading hate against other parties. While people are airing their misogynist views about women and belittling the opponents. In the last month a number of incidents have surfaced that should be analyzed in the light of Prevention of Electronic Crime Act (PECA) 2016. 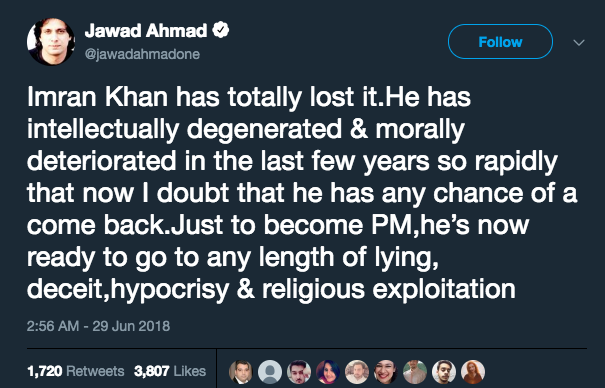 Shaikh Rasheed, Head of Awami Muslim League made derogatory remarks for the film on a live TV program about the Film industry and Rehman Khan (ex-wife of Pakistan Tehreek e Insaf’s chairman Imran Khan). 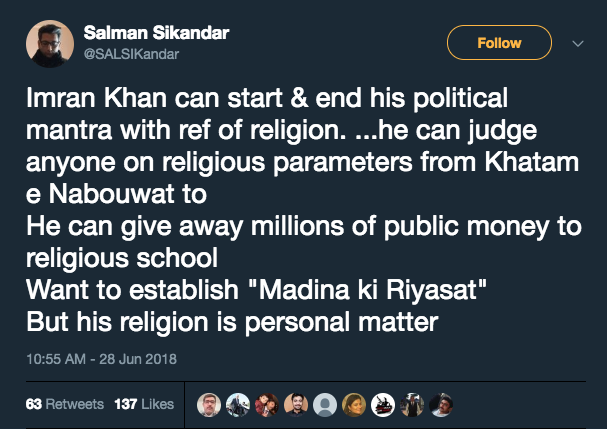 In a conversation with Sachi Baat With SK Niazi on Roze TV on June 17 he said that a thousand prostitutes are better than Reham Khan and said film industry actors and actresses were prostitutes. However later she removed those tweets, the reason for this is not clear. Passing insulting remarks against women is nothing new however when it comes to politicians hardly anyone speaks against them. Armeena did take a stand however later withdrew her tirade inexplicably. Shaikh Rasheed’s utterances fall under Hate Speech according to the PECA Chapter 1 clause 10, and PEMRA should also look into this as it was on live TV. 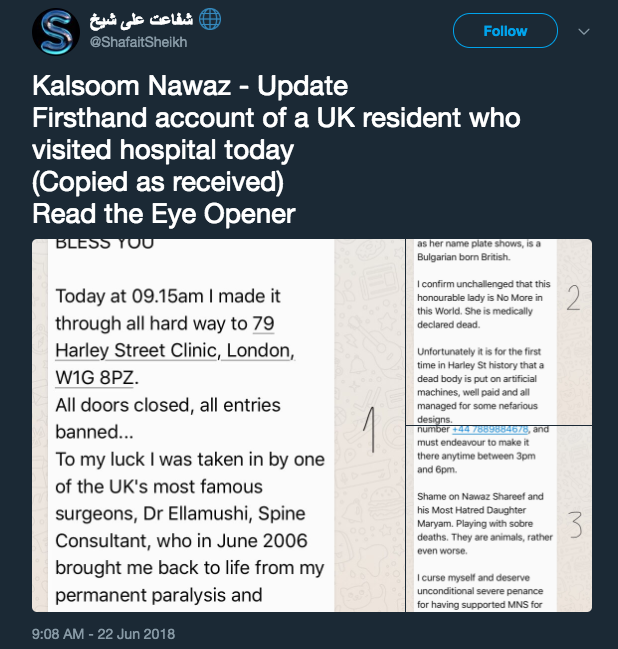 On the other hand, a widespread campaign is ongoing against Kalsoom Nawaz, wife of Ex PM Nawaz Sharif and mother of Maryam Nawaz on social media. 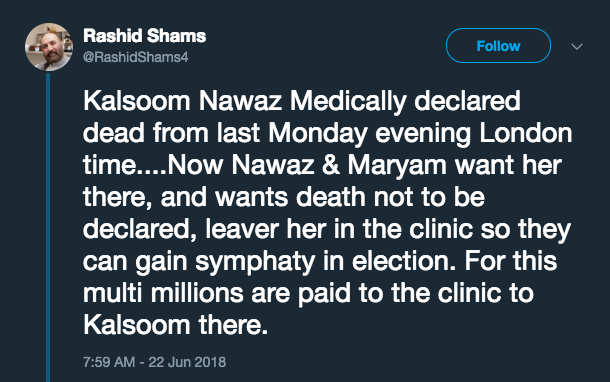 Kalsoom Nawaz who is in England for a couple of months now due to her treatment for Cancer, has been the target of a campaign against her and the family especially related to rumors she is dead and the family is hiding her death to gain voter sympathy. This campaign is ethically and legally wrong. A number of pictures also popped up on social media showing that she has died, which was a breach of privacy. Such videos and pictures do not only harass the family but also spread speculations among the general publics. According to PECA such campaigns can be taken to task. Since last year a number of cases have surfaced where some bloggers and activists have disappeared. 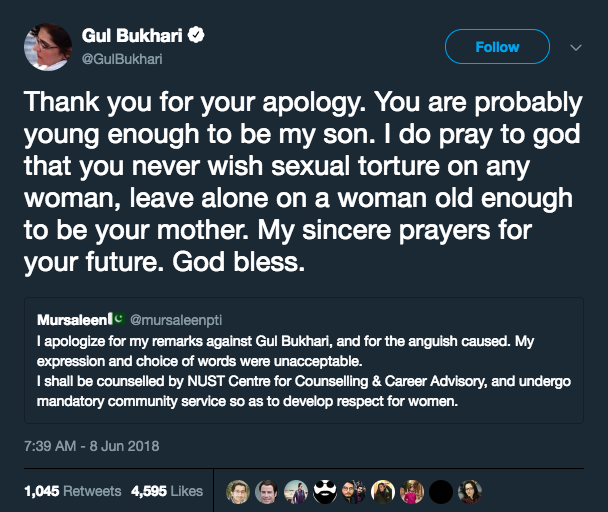 Gul Bukhari a journalist known for criticizing the Military disappeared for a few hours is a recent incident. Her views gained her a large number of people trolling her on social media. 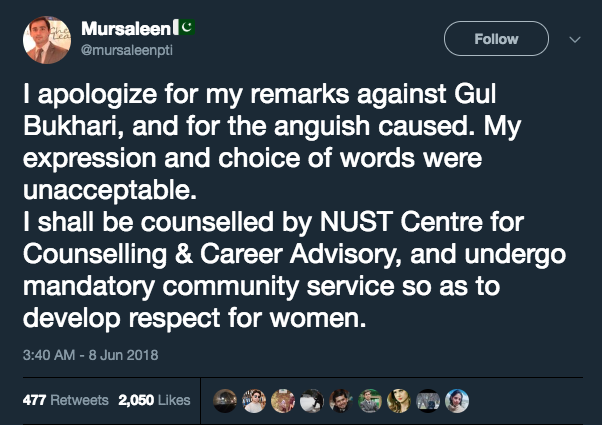 This incident is a classic example of how raising your voice against injustice and sexual harassment, can be highlighted and get the powerful machinery running. It is time people are more aware of their rights and duties as social media users. Freedom of speech does not mean promoting or supporting hate speech or threats. Let Elections 2018 be a healthy exercise in the battle of thrones instead of slit throat competition.